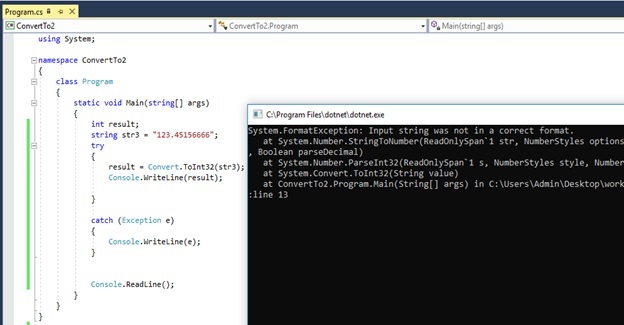 The main difference between int Parse and Convert ToInt32 in C# is that passing a null value to int Parse will throw an ArgumentNullException while passing a null value to Convert ToInt32 will give zero. C# is a modern, general-purpose, high-level programming language developed by Microsoft. It is a part of the .NET framework. It allows writing easy and efficient programs. A string is a data type that has a sequence of characters. In programming, it is required to perform processing on strings. There are various methods to convert a string to an integer. Two of them are by using int.Parse and Convert ToInt32. The main objective of using int Parse is to convert a string to an integer. According to the above program, str stores a string. The int.Parse converts it into an integer. Then, the value is stored in the variable result. Finally, the integer value is displayed on the screen. If the string is null, it will throw an ArgumentNullException. According to the above program, the str2 stores null. The int.Parse tries to convert it to an int and stores the answer in the variable result. As str2 is null, it is not possible to perform the conversion. Thus, it gives an ArgumentNullException. Then, the catch block executes, and the exception message is displayed on the screen. According to the above program, str3 stores a string. The int.Parse tries to convert it to an int and stores the answer in the result variable. As the value is a decimal value, it is not possible to perform the conversion. Thus, it gives a FormatException. Therefore, the catch block executes, and the exception message is displayed on the screen. According to the above program, str4 stores a string. The int.Parse tries to convert it to an int and stores the answer in the result variable. As the value is too large, it is not possible to perform the conversion. So, it gives an OverflowException. Therefore, the catch block executes, and the exception message is displayed on the screen. The main objective of using Convert ToInt32 is to convert a string to an integer. According to the above program, str is a string. The Convert.ToInt converts it into an integer. Then, the value is stored in the variable result. Finally, the integer value is displayed on the screen. According to the above program, the str2 stores null. The Convert.ToInt32 will convert into an integer and stores in the result variable. Finally, it will display the value 0 on the screen. According to the above program, str3 stores a string. The Convert.ToInt32 tries to convert it to an int and stores the answer in the result variable. As the value is a decimal value, it is not possible to perform the conversion. So, it gives a FormatException. Therefore, the catch block executes, and the exception message is displayed on the screen. According to the above program, str4 stores a string. The Convert.ToInt32 tries to convert it to an int and stores the answer in the result variable. As the value is too large, it is not possible to perform the conversion, giving an OverflowException. Therefore, the catch block executes, and the exception message is displayed on the screen. 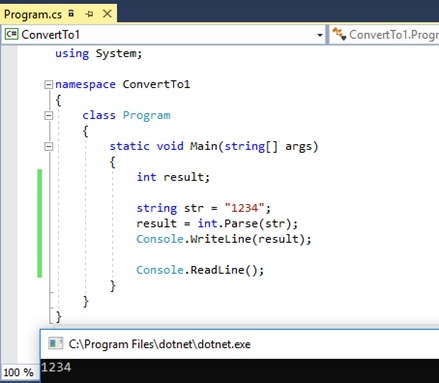 Both int Parse and Convert ToInt32 in C# convert a string to an integer. In both, passing a data type other than an integer will give Format exception. Moreover, passing a large value will give Overflow exception. 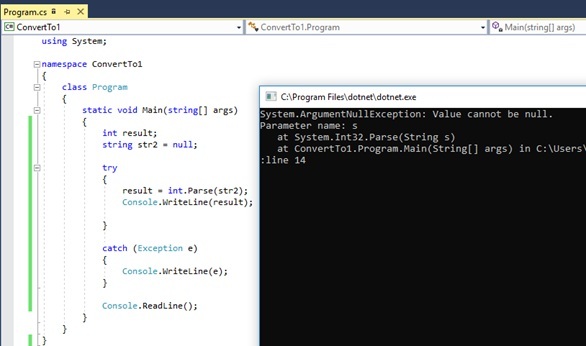 The int.Parse is a method in C# that converts a string representation to a corresponding numerical integer value. 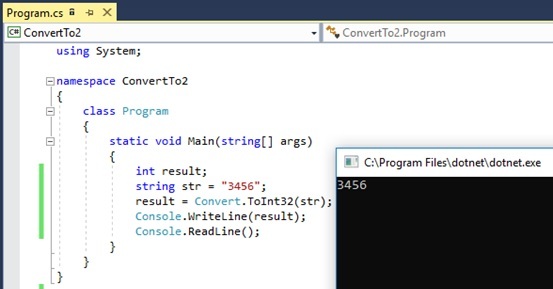 The Convert.ToInt32 is a method in C# that converts a specified string representation of a number to an equivalent 32-bit signed integer. This explains the main difference between int Parse and Convert ToInt32 in C#. Another difference between int Parse and Convert ToInt32 in C# is that, in passing a null value, int.Parse will give an ArgumentNullException while Convert.ToInt32 gives a zero. In brief, int.Parse and Convert ToInt32 are two methods to convert a string to an integer. 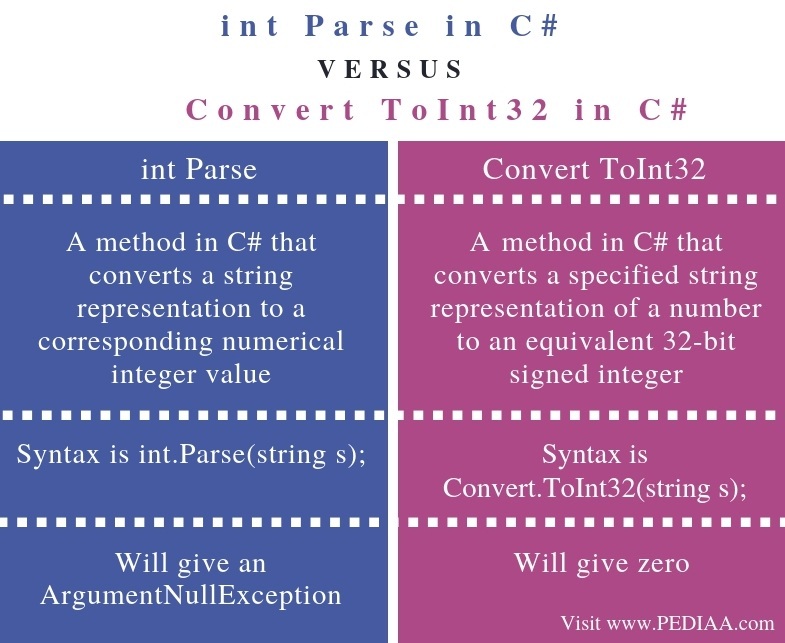 The main difference between int Parse and Convert ToInt32 in C# is that passing a null value to int Parse will throw an ArgumentNullException while passing a null value to Convert ToInt32 will give zero. 1. BillWagner. 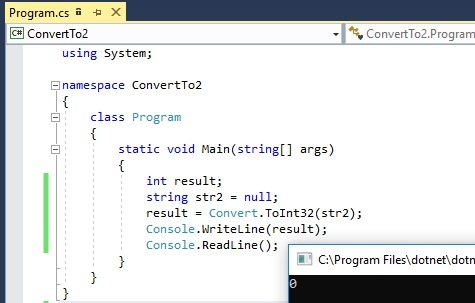 “How to: Convert a String to a Number (C# Programming Guide).” Microsoft Docs, Available here. 2. “Convert.ToInt32 Method (System).” Convert.ToInt32 Method (System) | Microsoft Docs, Available here.